Showing 27 articles from January 27, 2013. The Coast Guard rescued four people and their dog near Leadbetter Point at the entrance to Willapa Bay after their vessel, Genesis A, ran aground early Friday morning. Genesis A became lodged on a sandbar after the driver of the boat fell asleep, according to Petty Officer Third Class Jordan Akiyama. State Senator Brian Hatfield (D-Raymond) recently accepted a new chairmanship of the Senate Agriculture, Water and Rural Economic Development Committee. Raymond clinched the Pacific League championship by crushing Northwest Christian 49-40 Saturday night at Lacey. It was the 18th straight win for the Lady Seagulls of head coach Jon Schray. Raymond received a stiff challenge from the stubborn Lady Navigators, who are usually a stiff opponent in their own gym. The Pacific County Sheriff’s Office received a gift in the form of a patrol boat from the Cowlitz County Sheriff’s Office last Thursday. It will be used for official law enforcement business. The boat is a 1996 20-foot Almar jet boat. It will be used for patrol missions and search and rescue missions in Pacific County. It is not always possible to prevent homelessness, but a growing number of organizations in Lewis County are stepping up to the plate to help individuals survive and transition out of being transient. 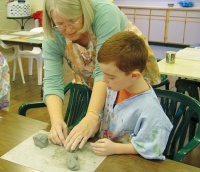 Di Morgan (left) helps Jay Foster (right) sculpt a plate from a lump of raw clay during Family Clay Day at the Morgan Arts Centre in Toledo Sunday afternoon. The annual event is advertised for participants between 6 and 96 and precedes Chocolate Making Day, which is scheduled for Feb. 12 this year. Hundreds of people would gather at some of the summer food gathering camps where they not only gathered food, but they also enjoyed such activities as visiting, horse-racing, bone games, trade and exchange, and arranging marriages. Gambling certainly involved transfers of goods from tribe to tribe. Senior Center Garage Sale held Sat. Jan. 26 was a Great Success, thanks to all the volunteers who put in hours and hours of work. Diana says: “Special thanks to my husband for hauling trash at the end of the day.” Benefits the Senior Center, supported by events such as 2nd Saturday Breakfasts, classes and events, including the Garage Sale. 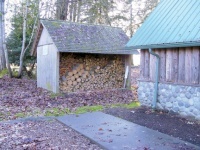 To book your gathering, contact Diana, diana.haug@lewiscountywa.gov or 864-2112. Crab Feed coming up March 2 at the Lions Club Hall. A whole crab, half a crab and or lasagna are the main features. 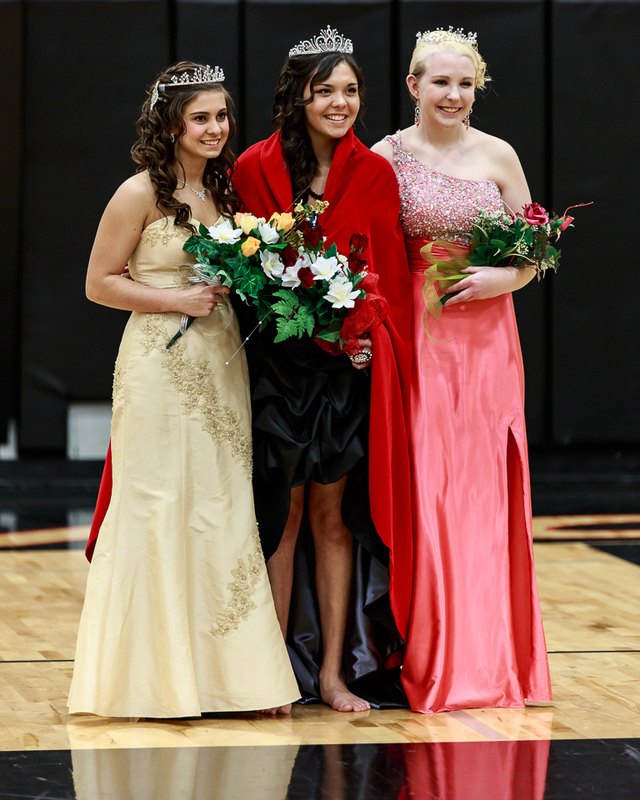 Tickets are available in advance and can be purchased by calling Carol Broom at (360) 295-3801. Be sure to get them soon. See you there! Joe Andrew Lundy, a longtime resident of Raymond, Wash., died on January 17, 2013, at the Veterans Hospital in Portland, Ore. Joe was born on June 4, 1933, to Charlie Lee Lundy and Ruby Fraley Lundy in Coeburn, Virginia. 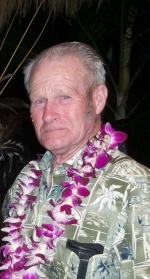 Clarence (Duke) F. Hoven passed away, surrounded by his loving family on January 20, 2013, following a courageous battle with cancer. He was 77 years old. After reading the write up in the Town Crier, on Jan. 9, 2013, pertaining to the Toledo Lions Club Wall of Honor, I was contacted by a non-veteran Toledo resident, who wishes to remain anonymous. I would like to take this opportunity to thank everyone who contributed to the success of the Toledo Food Bank Toy Drive. The Toledo Park Board has presented a plan to the City Council during their Jan. 22 meeting to fence off and secure the wood shed behind the kitchen at Kemp Olson Park due to the theft of wood by campers and other individuals. The Vader City Council is expected to vote on the issue of pay increases for city employees during their next scheduled meeting Tuesday at 6:30 p.m. in City Hall. SOUTH BEND – South Bend used its superior height advantage and Katlyn Sawyer pumped in 18 points and tore down a dozen rebounds to lead South Bend to a 50-37 thumping of Willapa Valley in a physical, turnover-filled game before a crowd of about 325 Saturday night at Koplitz Field House. With the win, South Bend pulled into a tie for second place with Valley in the Pacific League. Valley (12-7, 8-3) closes out the season against league champion Raymond (18-1, 11-0) Wednesday at Seagull Gym, while South Bend (10-9, 8-3) hosts Naselle (2-14, 2-9). The second place team gets a first round bye at the District IV tournament, which starts Tuesday, Feb. 6. at Montesano and Rochester. It would just be a sports season in Toledo without Kaelyn Whipp involved, but the community is going to have to get used to that concept soon. 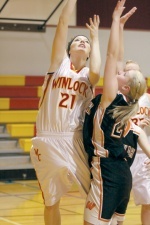 Whipp will be finishing up her final basketball games next month and then prepare for one final fastpitch season. Graduating seniors from the Toledo/Winlock/Onalaska wrestling team were honored during the last home game Thursday night as the team ended a strong season full of wins and trophies. The Toledo boys picked up a big victory this week in Trico League play and cemented their position in the WIAA State 1A rankings with a victory over Kalama on their home floor Friday night. 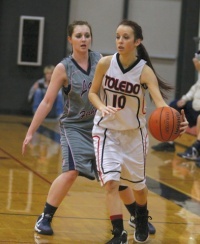 The Toledo girls are in a tough stretch of their Trico League schedule and will only get tougher in the next week. As they fight for a district tournament seed, the Winlock boys basketball team faced two of their closest competition and split in Central 2B League play. The Winlock girls scored their second victory of the year blowing by Wishkah Valley 57-11 in a non-league contest at home Saturday night. 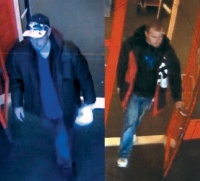 Investigators are seeking help identifying a pair of suspects connected with a burglary and ID theft near Onalaska Jan. 17. 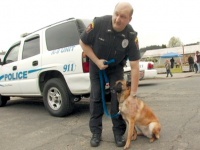 Winlock has bid farewell to drug enforcement duo Officer Steve Miller and K-9 Misha, who have both moved to the Upper Skagit Tribal Police Department.